Regular cheap such as Oscar- Meyer are definitely bad for you; who knows what meat it is, the additives, the corn fed meat..all bad. But grass fed beef or bison hot dogs, or Organic brands are wonderful for you. Plenty of organic brands even made uncured hot dogs. They are as healthy as any other protein. Another thing to be aware of is that Physicians For Responsible Medicine stance of nutrition is that a vegan diet is healthiest for humans, which is simply not true. Se my article here- Vegetarian Diets are NOT Healthy for Humans. The article is below and while they do go on to say that moderation is the key that we should eat less hot dogs. Again, it depends on which hot dog one is talking about. And I do agree that processed meats should be only a small, if any, part of our diet. But meat and fats are the healthiest part of pour diet and most people eat drastically too little of them. I don’t listen to much that the Physicians For responsible Medicine has to say any more because of their belief that meat is unhealthy. Notice I say belief, because studies, and science…does not support their position. My advise? Buy organic Grass fed bison or beef hot dogs, use healthy Ezekiel (gluten free) buns, load it up with organic relish, onions and condiments of choice and enjoy! INDIANAPOLIS — Instead of grouping hot dogs with Mom and apple pie, a national medical group wants you to consider them as bad for your health as cigarettes. The Physicians Committee for Responsible Medicine, a Washington, D.C., group that promotes preventive medicine and a vegan diet, unveiled a billboard Monday near the Indianapolis Motor Speedway with the advisory: "Warning: Hot dogs can wreck your health." Hot dogs, like cigarettes, should come with a "warning label that helps racing fans and other consumers understand the health risk," said Susan Levin, the committee’s nutrition education director. "It is not necessary to eliminate consumption of red or processed meat; rather the message is that these foods should not be the mainstay of your diet," American Cancer Society guidelines state. "Not any more than any other processed foods that we eat," said Hunt, as she finished off lunch in downtown Indianapolis. "There’s a lot of things that are going to cause cancer. Are hot dogs on the top of my list? No." "I don’t personally tell people never to eat hot dogs, because I guess I’m just realistic enough to know that people will still consume them to some degree," he said. 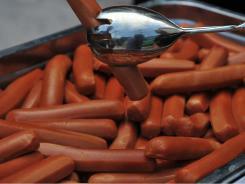 "A hot dog a day could send you to an early grave," said Levin, a registered dietitian. "People think feeding their kids these foods (is) safe, but (it’s) not." "Will it keep me from never eating hot dogs? No," Hanlin said. "But there’s no question I will try to limit it a lot more."